This feature is only available to project maintainers. 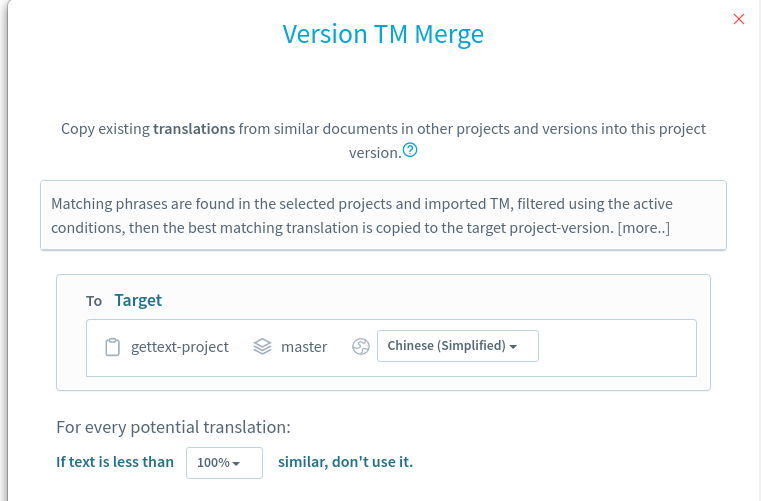 TM Merge translation can only be run if there are no other TM merge operations in progress for the selected version and locale. Select a project version you wish to copy translations to. Expand More Action menu on top right corner and click on TM Merge Translations. This action is only available if you are a maintainer of the project. In displayed dialog, select the language you want to copy and the percentage threshold for TM matches. Select TM sources. You can copy translation from either project TM or imported TMX or both. Based on your selection, you can also configure the copy criteria. If you just want to copy translations from certain project versions, ensure that Select TM from some projects is checked. Then use the search box to search for projects and add them to the From Source section. Adjust project/version order accordingly. Click Merge Translations button to start the process. The progress of the merge process is shown by a progress bar on the dialog. You can cancel the process before it finishes. Note: This will only stop additional translations being copied. Any translations that have already been copied will remain.